Many sites of bacterial infection such as in-dwelling catheters and orthopedic surgical sites require local rather than systemic antibiotic administration. However, currently used controlled release vehicles, such as polymeric films, release water-soluble antibiotics too quickly, whereas nonporous bone cement, used in orthopedics, release very little drug. The purpose of this study was to investigate the use of nanoparticulates composed of layered double hydroxide clays to bind various antibiotics and release them in a controlled manner. Mg–Al (carbonate) layered double hydroxides were synthesized and characterized using established methods. These clay particles were suspended in solutions of the antibiotics tetracycline, doxorubicin (DOX), 5-fluorouracil, vancomycin (VAN), sodium fusidate (SF) and antisense oligonucleotides and binding was determined following centrifugation and quantitation of the unbound fraction by UV/Vis absorbance or HPLC analysis. Drug release from layered double hydroxide clay/drug complexes dispersed in polymeric films was measured by incubation in phosphate-buffered saline (pH 7.4) at 37 °C using absorbance or HPLC analysis. 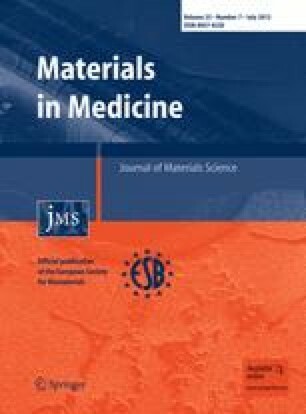 Antimicrobial activity of drug released from film composites was determined using zonal inhibition studies against S. epidermidis. All drugs bound to the clay particles to various degrees. Generally, drugs released with a large burst phase of release (except DOX) with little further drug release after 4 days. Dispersion of drug/clay complexes in poly(lactic-co-glycolic acid) films resulted in a reduced burst phase of release and a slow continuous release for many weeks with effective antimicrobial amounts of VAN and SF released at later time points. Layered double hydroxide clays may be useful for controlled release applications at sites requiring long-term antibiotic exposure as they maintain the drug in a non-degraded state and release effective amounts of drug over long time periods. LDH clay/drug complexes are amenable to homogenous dispersion in polymeric films where implant coating may be optimal or required.